Bazu Worku broke away from defending champion Vincent Kipruto with less than 2km to go to win the 69th edition of Lake Biwa Marathon writes Ken Nakamura. It was Worku's fourth marathon win in five outings since the start of last year. No less than 40 men passed 10km in 30:07 but by 26km it had reduced to nine, of which three were pacemakers. By the time they dropped out at 30km only Worku, Kipruto and Japan's Satoru Sasaki remained together. This trio played cat-and-mouse with each other over the next 10km covering the 5km sections in a pedestrian 15:50 and 16:06. Only then did Worku, who had gone through a bad patch just after 35km and was briefly lagging behind, make his decisive surge. Sasaki passed Kipruto on the track 300m from the finish to place second, nearly two minutes faster than his previous personal best of 2:11:28. Japan's big hope Yuki Kawauchi started to fall off the lead pack just beyond 22km, but he still ran a tenacious and well-timed race to pick off the faltering runners one by one in the final 10km to eventually finished fourth. Two weeks ago he had won the Kumamoto Castle Marathon in 2:10:14. Stephen Njoroge snatched a dramatic come-from-behind victory over Mexican favourite Daniel Vargas in the 26th edition writes Alan Brookes. Shewarge Amare had a more comfortable victory in the women's race to become the first Ethiopian champion in Latin America's fastest marathon. It was already 16°C on the startline in front of the Grupo Lala headquarters, and 22°C degrees by the time the winners reached the finish line at the Bosque Venustiano Carranza. The race winds its way through the cities of Torreon, Lerdo and Gomez Palacio at an elevation of 1000m. and is a gift from the dairy conglomerate Grupo Lala to the community that it calls home. A new event, the recreational "Rodada Ciclista" with 1700 riders was held on the full marathon course the Sunday before to begin a week-long "Fiesta Lagunera". Equally impressive, a 25m high permanent arch was erected at the Finish Line. "El Grito de Triunfo" was created by Torreon architect Mario Talamás Murra, and also featured on this year's t-shirts and Finishers' medals. A record, sold-out crowd of 5000 runners from eight countries took part and more than 100,000 spectators lined the streets. Hillary Kimaiyo charged to the front from the start. 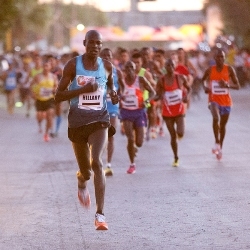 It is a tactic that has won him many victories in Mexican races, including the 2011 edition of this race where he set the course record of 2:08:17 — the Latin American All-Comers Record. Kimaiyo pulled a lead pack of eight through 5km in 15:36. After 8km they split into two groups of four — the first group continuing to push the pace. Vargas led through halfway in 1:05:38 with only Simon Kariuki now tailing him. By 25km he was on his own and almost a minute ahead of Njoroge. The gap had increased slightly by 30km and all the way through Gomez Palacio Vargas looked to be comfortably heading for a popular Mexican victory. Then disaster struck as he was forced to stop and stretch with leg cramps just before 35km. He stopped a second time at 36km, and again with 40km in sight. Njoroge patiently closed the gap to overtake him at 40km and open up a 50 second gap by the time they reached the Grito de Triunfo. 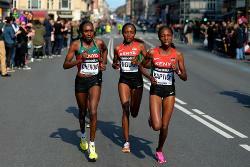 The women's race provided an early duel between Ethiopian Shewarge Amare and Kenya's Emily Chepkorir. 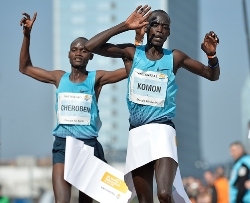 They went through 10km together in 35:37 before Chepkorir opened a 13-second lead at 15km. By Halfway they were back together, before the Ethiopian took control to eventually build up a comfortable five-minute winning margin. The 15th Antarctica Marathon attracted 187 runners from 22 countries; one of them was the first totally blind runner to finish the event writes Patrice Malloy. Thirteen temporarily resident base personnel representing Chile and China joined the field. 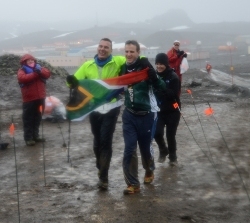 Blind since birth, south African adventurer Hein Wagner had to recruit a fellow entrant, Nic Kruiskamp as a late substitute to guide him during the race. Kruiskamp was tethered to Wagner by a short stick and gave him constant voice instructions to help Wagner navigate the muddy, brutally hilly course. The two men, who met for the first time less than a week prior, finished the gruelling event in under six hours. "I do not recommend anyone running this course with their eyes closed," said Wagner "I had to have full concentration so to not fall and injure myself." 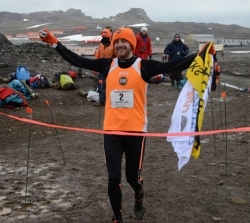 The Marathon and Half-Marathon courses use rudimentary gravel roads that connect the research bases of Uruguay, Chile, China and Russia on King George Island, located at the tip of the Antarctic Peninsula. Race day temperatures were around 2°C with sleet, intermittent rain and 40km/hour winds. The event was held in two stages on 9 and 10 March to observe environmental restrictions of a maximum 100 visitors on shore in any single landing area. Bartosz Mazerski of Poland went to the front early and opened an insurmountable lead to cruise home to victory. Women's winner Stephanie White of New Zealand placed ninth overall. Twenty runners completed their goal of finishing marathons or half-marathons on all of the Earth's seven continents and were inducted into the Seven Continents Club. Track specialist Bedan Karoki made a great debut over the half marathon distance to win in an under-the hour performance writes Antonio Manuel Fernandes. Karoki was in some discomfort in the early stages and lagged behind the leading group, but he got to the front at 10km, joining his countrymen Silas Kipruto and Ezekiel Chebii, and Eritrea's two-time world cross-country medallist Teklemariam Medhin. Mehdin briefly took the lead but the Kenyan trio overtook him in the final quarter of the race before engaging in their own private battle for the podium places. Chebii lost contact with his comptariots in the 14th kilometre and although Kipruto stayed with Karoki until just after 18km, Karoki proved too strong for him over the final 3km. "This wasn't the debut race I dreamed about," said Karoki, who will switch his attention back to the track this summer and then contest another half marathon late in the year. "I had problems. The course is great, totally flat, I'm sure it is the place to do it [break the world record — the last two of which were set on this course by Erritrea's Zersenay Tadese]. I expected more [of myself]." But Karoki is now a force to be reckoned with on the roads after also making his debut over 10km in San Juan three weeks earlier, winning the World's Best 10km in 28:35. On an unseasonably hot day in the Portuguese capital, with temperatures rising to 22°C, many struggled to cope with the conditions. Despite some small changes to the course designed to make it flatter and faster, the winning men's time has only once been slower in the past decade. In the women's race Ethiopia's Werknesh Degefa held off Kenya's Jemima Jelagat to win by two seconds in 1:08:46, 18 seconds short of the course record set by her compatriot Aberu Kebede in 2011. Jelagat and Flomena Chepchirchir forced the pace from 10-15km, with Degefa and Kenya's Eunice Kirwa just behind them, but the Ethiopian kicked hard at 20km and only Jelagat could stay with the change of gear, before losing out to her at the finish..
Yakob Jarso took almost five minutes off his previous best to become the first ever Ethiopian men's winner at this famous race which can trace its history back to 1931 writes Phil Minshull. Jarso led 10 runners through halfway in 1:03:23 and this pack was still together at 30km, reached in exactly 1:30:00. The crucial move came just after 35km when Jarso and Stephen Chemlany started to surge. One-by-one the other contenders dropped away as these two led Gilbert Kirwa and Tariku Jufar by eight seconds at 40km. Jarso then attacked again and it was enough to gain a crucial advantage which he held to the line. Chemlany improved his best by 80 seconds. In women's race, Kenya's Helah Kiprop was together with Ethiopia's Ashu Kasim at 40km but, in similar fashion to the men's race, she then pushed hard to leave her rival trailing in her wake. The race is a four-day long ultra around the biggest lake in Central Europe, passing through 42 towns, and villages. Participants came from 18 different countries and included a German group of 24 runners. Runners enjoyed good weather throughout, 14-20°C and sunny. The oldest was Miklós Szucs, 73 years, who ran in a relay team. 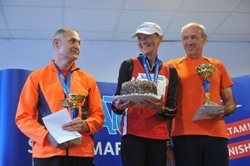 The Swede Monika Udd celebrated her 65th birthday on the last day of the race and celebrated both her retirement and victory in her age category with 24 hours 29 minutes. Shume Hailu and Geda Ayelu Lemma scored a double Ethiopian win at the 20th edition of the ACEA Maratona di Roma writes Diego Sampaolo. Rain and wind affected the winning times and made the course very slippery. The men's lead group of nine went through 10km in 30:21 and halfway in 1:04:25, by which time six of them remained. Just before 35km, Hailu, Sisay Jisa and Leonard Langat broke away, but Langat dropped behind the Ethiopian pair 2km later and Hailu started his kick from 38km. 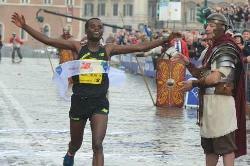 He finished strongly despite the conditions to become the seventh Ethiopian runner to win the Rome Marathon. Lemma led the women's race from gun-to-tape taking a 50-second lead in the first 5km, and had increased it to three minutes by halfway, reached in a quick 1:13:31. Her paced slowed dramatically in the second half but she still marginally increased her advantage. Conditions were tough for the tenth edition, with temperatures between 5–7°C, winds gusting up to 80km/hour and wintery showers. A record 60 runners, 50 men and 10 women, took part and 12 teams competed in the relay. A total of 17 international runners travelled to Stanley to take part in the event, representing seven nationalities, including the UK, France, Argentina, Nepal, South Africa and Australia. Kenya dominated the women's race to take the top five places and reclaim team honours from their Ethiopian rivals writes Mike Rowbotham. The race got underway in bright sunshine, a temperature of about 14°C lightened by a breeze. Despite her protestations the day before, Italy's Valeria Straneo was soon pushing the pace at the front, just as she had during the IAAF World Championships Marathon in Moscow last summer. By 3km the field had elongated, with those still bunched at the front around Straneo including Croatia's Lisa Stublic. Shortly before 5km (16:14) the Kenyans made their move. Before long the five of them were arraigned across the road, their arms and legs pumping in unison, issuing the unspoken message: "Pass us if you dare." Four Ethiopians were ranged behind them, along with Straneo and France's Christelle Daunay. Although the pace increased a bit, with a group of nine passing 10km in 32:13, no one did dare. Straneo determined to stay on an even pace and drifted off the leading group to eventually finish eighth. Daunay likewise found the pace too hot and eventually took seventh. By 13km only Ethiopians Netsanet Gudeta and Hirut Alemayehu were offering a challenge to the Kenyan quintet, with the latter beginning to fade. A kilometre further on the leading group was down to four Kenyans — Cherono, Chepyego, Wacera and Kabuu, with Wacera checking back down the road to see the two Ethiopians fast losing distance. Kabuu, who was the fastest half marathoner in the world last year with 1:06:09 was the one who dropped out of the medal placings at around 16km. 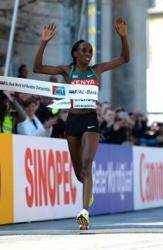 Cherono made her decisive move at 19km, as the course started to climb gently towards the finish. Her strength was immediately apparent as the other two were swiftly outpaced. Once safely over the finish line all five Kenyans embraced each other, enveloped by their national flag. It had been a perfect performance. There were 37 personal bests from the 88 finishers in the women's race — a testament to the conditions and the course. Iceland's Martha Ernsdottir, aunt of world youth 800m champion Anita Hinriksdottir, became the oldest ever competitor at the World Half Marathon championships, finishing 82nd in 1:24:24. The 2000 Olympian had competed at the first edition of the World Half Marathon Championships back in 1992. In the men's race Zersenay Tadese, the dominant force in men's half-marathon running for almost a decade, was finally run out of the medals. He dropped back two-thirds of the way through the race as Kenya's Geoffrey Kipsang Kamworor took his crown and posted the fastest time of the year in doing so. But the twist in the tale was that Tadese, after earning six consecutive silvers for Eritrea in the team event, finally got his hands on a team gold thanks to the additional efforts of Samuel Tsegay, who won the battle with Ethiopia's Guye Adola to take silver in a personal best, and Nguse Amlosom in fifth place. Kenya, team gold medallists on the past six occasions, had to settle for silver this time around, with bronze going to Ethiopia. Wilson Kiprop, returning to the event for the first time since winning the individual title in 2010, was billed as Tadese's main rival, but it was Kipsang who proved stronger than either. In his record ninth appearance in the Championships Tadese's medal-winning sequence of five golds and a silver in the previous six editions ended with a fourth place. Yet his time was faster than his winning performances from 2008 and 2012. The medal winners had effectively separated themselves by 15km, with Kipsang driving ahead and Tsegay tracking him, a few metres ahead of the Ethiopian. 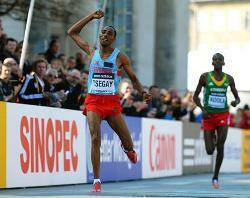 At one point Tsegay strained to look back to see how far behind his famous compatriot in the pale blue shirt was. The gap was too much to make up, and Tsegay, whose previous best at these championships was fifth, concentrated on his own performance. By the 5km Tadese had moved into the lead, with his team-mates Tsegay and Amlosom running at his shoulder, and Moses Kibet of Uganda also showing well. The Kenyans soon responded and within another kilometre Kipsang and Kiprop led, with Tadese just a stride behind in the centre of the leading group, and a rank of Ethiopian shirts also in contention. By 12km mark the leading group of six had broken clear, and as Kipsang continued to drive up the pace from the front, six soon became three, and the only remaining question was which order the three leaders would assume on the podium. Tadese, sweat beading on his brow and shoulders rolling with effort, came home in a time that was more than a minute slower than the world record of 58:23 he set in Lisbon four years ago. Eritrea's team title brought Tadese's medal tally at the World Half Marathon Championships to a record 13, six of them gold. The flat and fast course around the city centre allowed 13 of the first 20 men home to set personal bests. Among the 30000 runners who set off immediately behind the elite men's field there would have been many more. Running his debut at the distance Leonard Komon just edged out training partner Abraham Cheroben in a sprint finish. His time is an unofficial world debut record. With a tailwind during the first 10km the pace was fast, with a group of four passing 5km in 13:39 — pacemaker Vincent Rono led Komon, Cheroben and Daniel Chebii and reached the 10km point in 27:40, on world record pace. But as Rono finished his pacing duties and the group of three turned into Kurfurstendamm after 11km they were running into a headwind. While Chebii could no longer hold on, Cheroben (with a previous personal best of 60:38) took the lead. But the pace did drop and the world record became unrealistic after 15km was reached in 41:44 and it became all about winning the race. In a sprint finish Komon, who is the world record holder at 10km and 15km, just nipped Cheroben. The course record remains at 58:56, set by Patrick Makau (Kenya) in 2007. Komon finished ahead of eleven fellow Kenyans. In the women's race Kenya's Agnes Mutune and Tadelech Bekele led from the beginning. With just over 2km to go 22 year-old Bekele moved ahead. It was sunny and unseasonably hot, but over 1000 people ran this flat course that starts and finishes in the square in front of City Hall. Visitors had great views along the race route which passes through the most beautiful parts of Novi Sad: along the banks of the Danube, new bridges, the University district, the Tanurdziceva Palace, the old House of Assembly and the Petrovaradin fortress.